Kalsi Engineering is very pleased to announce a collaborative effort with Packard International, Inc. to provide high pressure washpipe assemblies to the oilfield drilling industry. Units with three-inch bores are undergoing field evaluation, and units with four-inch bores are currently being designed. The units are intended for mud pressures up to 7,500 psi and rotary speeds up to 200 rpm. Packard is providing manufacturing, marketing development, inventory management expertise, and customer support. Kalsi Engineering is providing the initial hardware designs, ongoing engineering support, and a license to use our patented high-pressure rotary seal and seal mounting technology. The unique capabilities of each organization provide a strong framework for a long and fruitful business relationship. The high-pressure capability of the new assembly is provided by a plastic lined Kalsi Seal that is supported by a floating metal backup ring that aligns with and follows the lateral motion of the rotating washpipe. 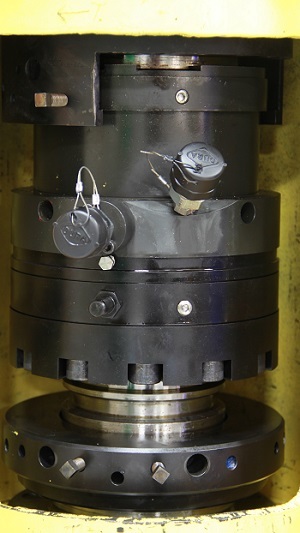 The unique design of the backup ring makes it substantially immune to pressure-related distortion. This dimensional stability allows the backup ring to define an extremely small and stable extrusion gap with respect to the washpipe, providing optimum support to the high-pressure rotary seal. At the same time, the relatively high modulus of the plastic lining of the rotary seal provides excellent high-pressure extrusion resistance. The seals also incorporate an innovative set of hydrodynamic features that force lubricant into the dynamic sealing interface during rotation, to reduce wear and seal-generated heat. This combination of a very small extrusion gap clearance and a hydrodynamically lubricated high modulus sealing material has provided the most pressure X velocity (PV) capacity of any rotary shaft seal assembly we have ever developed. An annular piston balances the pressure of the seal lubricant to the pressure of the drilling fluid. The high-pressure rotary seal is isolated from the drilling fluid, and retains the pressure of the clean seal lubricant. A separate rotary seal partitions the seal lubricant from the drilling fluid, and is isolated from high differential pressure. This seal also incorporates features that produce hydrodynamic interfacial lubrication in response to rotation. This photo shows the installed high pressure washpipe assembly.